I leave the store and start for home but there is a major traffic jam on the main road to my house. I cut through and decide I'll hit the Interstate and get home quick. Several hundred other drivers had decided to do the same thing. I cross over the road leading to the Interstate, thinking I'll take the back-road and get on at another entrance ram. Only this back road is down to one land because of construction. So I cut back through to the original road toward the Interstate and get stuck in traffic yet again. I finally veer to the left on yet another road and finally, finally get moving again. Just one little construction sight on that one where I had to swerve into another lane. A trip that normally takes me fifteen minutes took me almost 45 minutes. I tell you, I was swerving, shifting, turning and merging with all the finesse of Steve McQueen or Tom Cruise. When I finally got home, I was so exhausted I didn't even pull out my treasures to try on and enjoy! My husband was home by then and of course, I had some explaining to do. So I told him all about my harrowing experiences trying to get across town and by then I had him so confused and weary he forgot all about the packages I brought in. (I also learned how to hide things by watching spy movies!) Driving in traffic is frantic and scary. We have to always be ready to take a different way home. But then, that's part of the adventure I suppose. (The picture is of me in front of an Aston Martin at a James Bond inspired-fundraiser! )I sure needed that car the other day. What is your worst traffic nightmare? Today is my day to blog. Actually, it's also a day to work hard on the revisions of a book (Winter Reunion) that will be out in November, and though I'm sorely tempted to also tackle the catastrophic jumble in my office, I'm keeping those impulses firmly in check. But oh, how easy it is to be distracted! Have you ever had one of those days? So far....I've been out to the barn to feed the horses. Husband wanted breakfast, too. Had the dogs outside twice. No, wait a minute---three times. Went back to the barn to let the horses out. The phone has rung more times than I can count. Husband announced he was taking the day off (oh, no!) to do things around the place, which means Helper #1 is on call. Luckily he has gone off to run errands and I was able to decline that trip to town. But then I happened to check e-mails, and discovered three or four things that had to be addressed...now. And the cement people are back, working outside on a patio area that flanks my office...replacing old, cracked concrete with new. So I'm typing this blog in time to the sound of a jackhammer ...and the dogs are going crazy! But in a few minutes, I'm going to enable Mac Freedom (a free program that disables my internet for a set amount of time, to avoid any temptations at that kind of distraction), take the dogs out again, say a prayer for good progress, and get to work. I think all of us set goals, planning to be productive. What do you do to keep on track when you have a project to complete? If you have any secrets to share, I would love to hear them!! There are a lot of ways to kill people. As a romantic suspense writer, I have to know as many as I can and find the one that fits the story I'm writing. Of course, there is always the old standby of shooting a person with a gun or using a knife. Then there is strangling someone. Or how about using poison? The problem there is finding the right one that will work in your story. What is the most unusual way you've read or heard of someone being murdered? 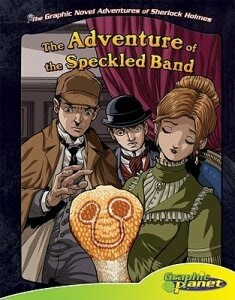 One (The Adventure of the Speckled Band) I read about in a Sherlock Holmes's short story collection was interesting. It was the story where a swamp adder from India was used to slink up and down a bell-rope and through a ventilator into the bedroom next door. The swamp adder might not bite the victim the first or second night but would eventually. The snake was lured back to the room where he was kept with a whistle. The victim was locked in the room so it was a mystery of how the person died when she was locked inside. Today we're welcoming Morgan Alexandria, the heroine of Running for Cover, Shirlee McCoy, March 2010. Wow, you've just had quite an adventure. I’ve made a lot of mistakes in my life. One of the biggest was marrying my ex. Cody never cared about anyone but himself, and if I’d been a different kind of person when I met him, I might have realized that. When he went to jail for murdering his business partner, I thought he was finally done causing trouble in my life. I was wrong. When two men broke into my art gallery and nearly killed me, I realized that Cody had gotten himself into the kind of trouble he wouldn’t survived, and somehow he’d pulled me into it with him. 2. So, during the book you met Jackson Sharo. Tell us a bit about him/her. What was your first impression? When did you know it was love? Jackson is a true hero. He threw himself into danger to save me…a woman he didn’t even know. What kind of guy does that? His faith and integrity make him the kind of man anyone can rely on. For me, though, it was difficult to acknowledge my feelings for him. I’d been hurt way too many times, and I didn’t want to be hurt again. Jackson’s support never wavered despite my doubts, and I soon realized that I would rather risk a broken heart than regret not letting him into my life. I’m independent and strong. I know how to achieve my goals and dreams, and I don’t rely on others to help me through the tough times. Those things are both my greatest strengths and my greatest weaknesses. 4. What scares you? The thought of losing those I love most. 5. If you could change one thing about yourself, what would it be? I would be more open to other people. More willing to give of myself emotionally. 6. Where are you in your faith at the start of your story? My faith was strong but shaken by my past. 7. Where are you in your faith at the end of the story? I realize that God has always been with me and that, despite my failures, He has never turned away. Hosea 11:4 I led them with cords of human kindness, with ties of love; I lifted the yoke from their neck and bent down to feed them. I love this verse! I have often felt burdened by regret, and Hosea 11:4 reminds me of God’s love and grace. When I read it, I can truly imagine Him reaching down and lifting my burden. I can picture Him offering the truth of His mercy and grace as my sustenance. 9. If you could be a dessert what would you be and why? Carrot cake. Carrots and sugar and spice. Lots of strong flavors that don’t seem like they can work together, but they do. Just like me and Jackson! Thank you Shirlee for sharing Morgan with us today. This sounds like a great read! Hello, all! 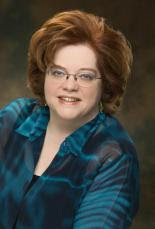 Liz Johnson here, author of The Kidnapping of Kenzie Thorn. I'm thrilled to be joining the Craftie Ladies of Suspense blog, and was super-honored to be invited to be part of a group with these other amazing authors. I'm a big fan of all of them. I figured for my first post here, I'd start with a confession: I usually read the last page of a book first. I know ... I know. I break the most important rule of reading a book. And I've been chided by purist readers for doing so. But for me, it just makes the reading more exciting. It makes me keep my eyes open for clues and hints that point to the ending. I don't read the last page. I don't spoil the mystery. And I don't break the rules when it comes to reading suspense. I love the build up and the nail-biting tension. I love the way a good suspense novel keeps me up late into the night, unable to sleep until I know what happens! Are you a rule-breaker or a purist when it comes to reading? Why do you love suspense? So thanks again for having me. It's such a pleasure joining these Craftie Ladies! 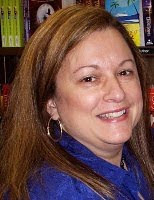 Feel free to stop by and visit me at http://www.lizjohnsonbooks.com/. Every go somewhere and walk away thinking about something you're pretty sure nobody planned on you focusing on? Seriously. Last week I took my 9 yo daughter and three of her friends and their moms to the Rock and Worship Road Show. It was a truly great Christian concert. Seven bands and lots of great music. David Crowder Band. Fee. Mercy Me. Sidewalk Prophets. Francesca Batistelli. etc. But what I'm still focused on is the way that the show wasn't about egos. Instead, it was all about worshipping God and bringing glory to Him. Mercy Me closed the concert by walking off as the audience was singing one of their current worship songs. That's what I want my life to be. That no matter what people say or think about me, that I am always pointing to God. That my life is about reflecting glory to Him. That it takes people five minutes to realize where my heart is focused. Some days I do well at this. Other days not so well. But my heart's cry is to bring glory to Him. For all the ways He has changed my life. And that blur in the photo? 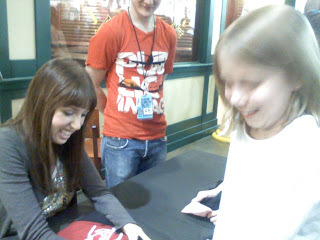 My little girl getting a bag signed by Francesca. Made her day! My daughter's that is. 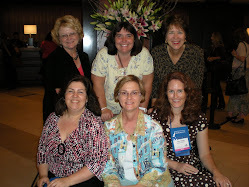 RWA Announces the RITA and Golden Heart Finalists! 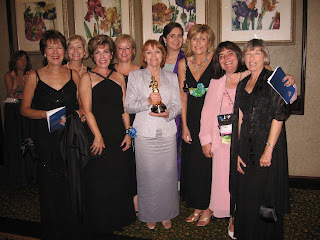 Tomorrow Romance Writers of America will announce the RITA and Golden Heart finalists. Writers from around the country--even around the world--will be waiting to receive calls that announce their top placements. Throughout the day, emails will sail back and forth as hopeful aspirants wait in anticipation. I enjoy reading those cyber messages and can feel the swell of excitement as the calls go out. Yes, I entered, but the competition is stiff and the odds are I won’t final. That’s okay. I’m excited anyway. Will I do anything different on Thursday? Probably not. I’ll work on my current work in progress, check my favorite blogs, take a walk, run some errands, fix dinner for my family and do all the other things that normally fill my day. But I will be rejoicing with those who are selected. Congrats in advance to all the finalists. Congrats, also, to all the writers who entered. How will you spend this Thursday? 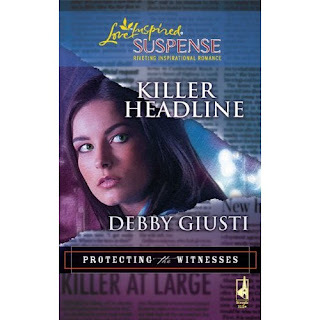 KILLER HEADLINE, available from Steeple Hill Love Inspired Suspense, now in large-print hardcover. Hi, Terri Reed here wanting to let you know about an upcoming event. Readers Luncheon on Saturday, April 17, 2010 from 9 am to 2 pm. 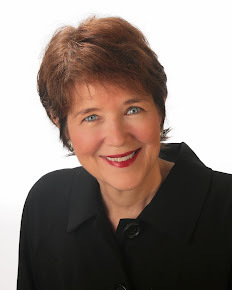 This year's guest speaker is bestselling author of classic romance and modern women's fiction, Jane Porter. 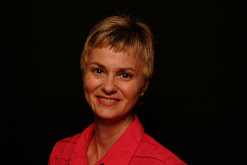 Jane's presentation, entitled Be The Hero of Your Own Story, is sure to inspire. Pamela Tracy here, and gasp did you knowthat writing wasn't my first job? Nope, it wasn't. This morning, thanks to my birth mother, I took a little walk down memory lane courtesy of a blog centered in Omaha, Nebraska, where I'm from. The blog was called Forgotten Cuisene, and yup, it was all about food. A marker from my past was there among the pictures. Picture me at age fifteen (same hairstyle but much, much, much longer and skinnier, too). I didn't have a car yet but I was saving my babysitting money. 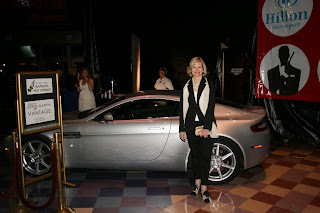 My friend Sandy was older; she had a car. One day after school I hopped in her car and she said, "I have to stop by Mr. C's." 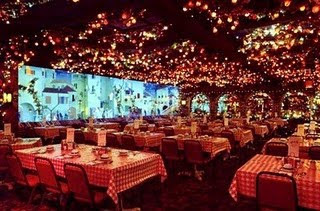 This was a big family owned Italian restaurant. I'm not sure I'd even been there. "Why?" I asked. She uttered a word I hadn't even thought of yet: job. She parked, she existed, I followed. The hostess, for some reason, handed me an application, too. I filled it out (and I had to lie about my age). One week later, I had a job and for some reason, Sandy did not. 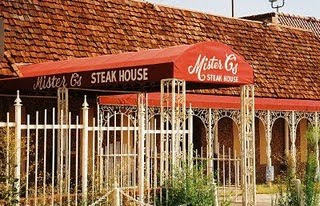 I worked at Mr. C's from the time I was 15 until I went off to college. I started as a coffee girl. Yup, that was my only duty. I walked around the restaurant and made sure that everyone had a full cup of coffee. I progressed to water girl, meaning when people newly arrived, I'm the one who gave them their water. From there, I went to settings (rolling silverware, arranging plates, coffee cups, and saucers, on a tray) to bus girl, to finally cook. I met my best friends at that job (waving at Patty, Robin, Julie, and Sammi). I have burns from the pizza oven and still blame at least five of my pounds on Mr. C's pizza. Up until five years ago, every time I went home (I still think of Omaha as home), my girlfriends and I (sometimes with kids and hubbies along) would meet at Mr. C's and eat. I often write waitress heroines, btw. It closed down five years ago. A nail in the coffin of favorite memory. 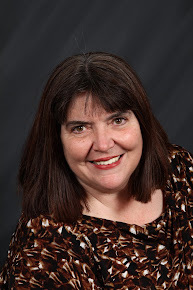 Today we're welcoming Hannah Williams, the heroine of Cowboy Protector, Love Inspired Suspense, March 2010 by Margaret Daley. I fell in love with the wrong man. I discovered he was selling illegal arms and ended up testifying against him. I was then placed in the Witness Protection Program and moved to Montana to start a life with no ties to my past. 2. So, during the book you met Austin Taylor because he interviewed you for a job to care for his injured daughter, Misty. Tell us a bit about him. What was your first impression? When did you know it was love? I first saw Austin in the bus depot when he came to pick me up for my interview for the job. He towered over most of the people in the station and carried himself as if he could take care of any situation he was put in. It wasn't long before I began to fall in love with him even though I knew I couldn't stay at the ranch for more than a month or so. The way he loved his daughter and grandmother endeared me to him, but mostly when I was with him, I felt safe for the first time in years. I've learned to survive in a world where it is tough to know who to trust. My greatest weakness was my isolation from people. I missed so much, moving all the time, never getting to know anyone for long. Being caught by Devon Madison, my boyfriend's ruthless brother who had put a contract out on me years ago. But even more, dying alone with no one to care about me. I should have depended on the Lord more through my ordeal, instead of thinking I could do it all by myself. I'd lost my faith because I'd lost hope I would ever lead a normal life--have the family I always wanted. I've learned to put my trust in the Lord. I can't do it alone. I had to learn that was true and to turn to Him for help in my time of need. Thank you Margaret for sharing Hannah with us today. This sounds intriquing. Can't wait. 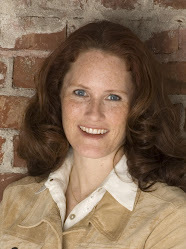 Today we’re welcoming Erin O’Malley, the heroine of Midnight Caller, written by Diane Burke and released March 2010. I am a single mom of a five-year-old son, Jack, who was born with cerebral palsy. I work as a nurse in the emergency room. My aunt lives with us and helps out caring for Jack. I guess you’d say I’m an ordinary person living an ordinary life. I never in a million years expected to draw the interest of a serial killer---but I did. 2. So, during the book you met Tony Malone. Tell us a bit about him. What was your first impression? When did you know it was love? My first impression of Tony? Well, when I recovered from the mega embarrassing position my son had put me in with the man, I had to admit I thought he wasn’t bad on the eyes, that’s for sure. Because I wasn’t interested in dating at the time and my heart would pitter patter whenever he was near, I tried hard to avoid him. It took me by surprise that I started looking forward to seeing him, sharing conversations with him, spending solitary moments with him as he continued to develop a relationship with my son. When did I know it was love? When I went through some of the most frightening and heart-breaking moments of my life and Tony was my rock, right by my side. Yeah, I will never forget how close we grew during those times. But then God always sees the bigger picture. It shouldn’t surprise me that when things seemed darkest, God brought something lasting and beautiful out of all of the pain. Would being a caring mom, an ER nurse, and a loyal friend count as strengths? As for weaknesses, I constantly have to battle my need to control everything around me. You’d think by now that I’d realize that no one can control their life, let alone the lives of those around them. But I still give it a good try! Haha. Spooky movies, Stephen King books, walking through parking lots at night---losing the people I love. I’d like to be a little less “responsible”. I’d like to relax and throw my head back and laugh a little more often. I really identify with that country western song that says something about having a choice between just walking through life or dancing, I’d like to think I’d pick dancing. My friend, Carol, had just introduced me to the Lord. I was brand new in my faith when this nightmare began. My faith---and gratitude for all God’s blessings---couldn’t be stronger. I think when we are made to face our own mortality that is when our faith is on the line the most. The moment of death causes fear in many people’s lives because, even though they profess to believe in life after death, up to now they’ve been accepting it on faith alone. Now there’re going to find out if the afterlife is real. It can be a scary time. When I was confronted by a serial killer, I stood in the shadow of death. I had to decide at that particular second in time whether to believe in the Lord, whether to trust Him or give in to my terror. That piece of scripture came to mean everything to me. Ohhhh, I love dessert. Any kind. Anytime. Anywhere. But if I had to choose one to represent me, I guess I’d have to say strawberry shortcake--- a solid, plain, reliable base but sweet and fancy as well. Ah, good Irish names. A woman after me own heart. Thank you for sharing Erin with us today. I look forward to reading this story. Does duMarier's Rebecca stand up to today's rules? Dana Mentink here and last night I finished listening to a spectacular audio recording of Daphne du Maurier’s 1938 novel, Rebecca. I was riveted of course, through all 12 disks, but I found myself wondering if Rebecca, arguably one of the best romantic suspense novels ever written, follows the tried and true rules of modern day romantic suspense novels. Let’s just check it out, shall we? Rule #1: No flashbacks. Good novels are action packed, moving forward without plot devices that stop the forward momentum. Rebecca is actually one giant flashback as the second Mrs. de Winter relates her memories from their residence in exile. Hmmmm. A novel sized flashback? I'd be hard pressed to sell that to my editors. Rule #2 : You need a strong heroine. I’m sure I’m going to get some e-mails about this one, but the second Mrs. deWinter is relatively powerless. Yes, I know the year is 1938 and women didn’t have much status in society but Mrs. de Winter is so powerless she can’t even manage to change the dinner menu, much less assert her place in the de Winter household with the nasty Mrs. Danvers. The book is largely about power and position so the protagonist fits in perfectly in her era, but she would not be a good fit in today’s romance novels. Heck, we don’t even learn the protagonist’s first name! Rule #3: The heroine must clap eyes on the hero in chapter one and they need to be together on virtually every page. Nah. Du Maurier’s characters are strong enough to handle a little separation. Maxim is often tootling off to London and it’s a good many pages before the hero is even introduced in the story in the first place. You’d think a novel which breaks so many rules would be hopelessly outdated and unattractive to the modern reader. So why does Rebecca still continue to fascinate seventy two years after it was penned? Because, though it doesn’t follow today’s formulaic rules of writing, it give us two critical components. The first is unforgettable characters. Personally, I rather despised Maxim and thought Mrs. de Winter was somewhat of a fool to follow Mrs. Danver’s advice about the fancy dress ball, but I found myself thinking about these fascinating, flawed characters long after I finished the book. Second, du Maurier does what all suspense authors aspire to accomplish: she neatly leads us into believing one thing will happen, and then completely turns the tables on us. I was absolutely convinced that Rebecca had conceived a child with Favell and Dr. Baker’s revelation at the end of the novel floored me. That happened many times in this amazing book right up to the fiery finish. The author never gives you what you expect, including a happy ending. Oh yes. That is cardinal rule #4. Always give the romance reader a happy ending. In Rebecca? Not so much. What do you think, dear reader, about Rebecca or any other classic novel that doesn’t follow our hard and fast rules? "Noooo." Caryn screamed the word, sure her heart had broken permanently as the scuffle slowed. It was impossible to see who had been shot or who held the gun. The McCreedy girl glided toward the men. Had she joined Brad in his crazed state during her imprisonment? Caryn couldn't let her hurt Patrick. Not now. Anne reached the men and kicked the gun from Brad's hand. He sagged on the floor, red seeping on his shirt. But then Caryn looked at Patrick and saw red spreading across his jacket. Brad scrambled to his feet, knocking Anne against a wall. "This isn't over. You can't throw a priceless jewel away and expect to get away with it." He stepped toward her, foreboding filling Caryn. Then she heard it. A small sound, but enough to give her hope they weren't alone. If she could only keep Brad distracted for a few more minutes without him killing her. "Why, Brad? Why do all of this? Patrick was your best friend." "Gambling debts. When some of New York City's worst crime bosses are after you, you'll do anything. Friendships are meaningless when you're threatened with certain death." He snarled at her. "Time is up. I've spent ten years side-stepping their demands, but no more. I've been guaranteed death if I don't have the money immediately." He turned to the side and picked up the gun pointing at her with unwavering directness. Caryn screamed, loud as she could then dove for the window. She perched precariously on the wide ledge. The ground stood several stories below her. Could she survive a jump? Brad cackled, a hideous, shrill sound. She glanced at him and stilled when she noticed Patrick creeping across the floor toward the crazy man. Could Patrick reach him and do anything to disable the man in his injured state? "Scream all you want. Anne here has convinced the village that a ghost lives here, keening for her lost love. Fitting don't you think." Caryn looked out again and edged closer to the drop. "Does it help to know the real brooch is resting safely in New York City." Brad roared, his face turning red. Patrick grabbed him around the ankles, pulling him to the stone floor. A moment later bobbing lights entered the room and handcuffs were snapped on Brad's wrists. Patrick's mum Emily smiled at them from the halo of torch light. "It's about time the two of you were reconnected." She inhaled sharply and hurried to Patrick's side. "What happened to you?" "Nothing a little trip to a hospital won't cure." Patrick smiled, the gesture tinged with pain. "You didn't arrive a minute to soon, mum." "Wanted to give you two time to reconnect first." She nudged Brad with her toe. "Didn't anticipate him shooting you." 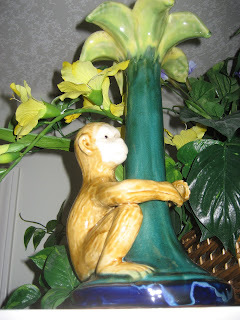 Caryn slipped down from the windowsill and hurried to Patrick's side. "We've so much to talk about." He brushed a strand of hair from her face. "Shhh. That can wait. First, though, I have a question for you. Will you marry me? It's time for another St. Patrick's Day wedding in the village, and I can't wait another minute to make sure you never disappear again." She studied him a moment, a slow smile spreading on her face. "Oh you have a lot to explain, Patrick. But I like the idea of you not disappearing again either." "Yes, it does." She threw herself in his arms, and he groaned in pain. "But first we'll get you taken care of." He grinned at her, the young man she first loved poking through the visage of a mature Patrick she couldn't wait to get to know and love all over again. Patrick shifted, acting as a shield by putting himself between Brad and the women. Caryn’s heart melted and love filled her to brimming proportions. Tears filled her eyes. She should have known Patrick wouldn’t have voluntarily broken her heart all those years ago. All the wasted years apart could never be regained. And even if by some miracle they survived this ordeal, a future together wasn’t possible. They had separate lives now, worlds apart. Caryn could feel Patrick’s questioning gaze but she couldn’t explain now. Caryn didn’t trust Brad to keep his word. He’d either kill them or leave them to rot in this tower, just as he had poor Anne McCreedy. Caryn touched Patrick’s hand, drawing his attention. For a moment, she held his gaze, hoping he would follow her lead. 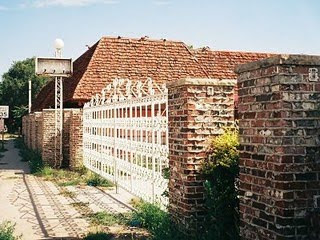 When Brad was within arm’s reach of the brooch, Caryn spun around and chucked the fake jeweled pin out the turret window. “No!” Brad lurched forward but it was too late. The brooch was now at the bottom of the mossy swamp at the base of the castle. Caryn braced herself. But Patrick vaulted across the short space to launch himself at Brad. The two men grappled for control of the gun. A shot echoed off the stone walls. “Do you know where we’re going?” she had to ask. “There are several passages to the pantry.” Patrick twisted hard on the old iron ring, and with the effect of fingernails on the chalkboard, the lock squealed and scraped, but turned. They stepped into another dark passageway, but this one had a drier smell to it. “They say the castle is haunted,” Caryn whispered, trying to catch her breath and fight off the shiver rippling over her. “Maybe it’s the McCreedy girl,” Patrick murmured. Caryn frowned at him. She’d known about that mystery for ages and talk of dead girls wouldn’t help them. The only thing that would was her knowledge of where the brooch was. Or should she say the paste imitation she’d had made up seven years ago. The family she’d worked for as a nanny owned a jewelry store, and unsure of what she should do with the brooch, she had asked for an assessment. It was worth a fortune, Caryn remembered as she followed Patrick up the old wooden steps to the pantry. Her boss had asked if a fake could be created for the local museum, as he was on the board of directors. Part of the permanent display there was centered on British peerage. He’d offered to pay for the paste and she’d taken him up on it only to ask him to borrow it. She hadn’t wanted to travel with the original. But that didn’t solve the problem of what to do with the original. So, for the last six years, it remained in her safety deposit box. Oh, how she’d tried to find Patrick and return it. But her letters had returned unopened, and calls had proved that the family had, at some point, switched numbers. She’d kept up with the news from here, hoping to hear something about them, but nothing. She wished she could have afforded a PI, but a nanny’s wages had prohibited that. “Where’s the brooch?” Patrick asked as they reached the old castle’s wide and low kitchen. A moan, low and long, cut the still, dusty air. Caryn gasped. Okay, there wasn’t any such thing as ghosts, but this castle...well, even she had felt eyes on her yesterday when she slipped in here. Patrick practically dragged her down the long hall. The moan continued, and as they finally reached the stairs that led up to the tower, he stopped. “Forget the brooch, Patrick.” But they’d already reached the tower. With a start, he shoved Caryn behind him. The McCreedy girl, the one who was supposed to have died here years before, stood before them, ragged and filthy, her messy hair and frightened expression hinting at abduction. She held the brooch in her scraped and dirty hand, but the look of terror on her face as she glanced over her shoulder caused both Caryn and Patrick to whirl around. Brad stepped out from behind the open door. Judging by the bark of heinous laughter while Brad was down, he wasn't out. Patrick nodded, not voicing all his concerns as he clutched Caryn's hand tightly and pulled her through the tunnel. Why hadn't he and his family caught on to Brad's mental state? They'd been college roommates all four years. Then, during the past ten years, Patrick had often visited Brad and his family. Of course, Brad had made the trek here even more often, always welcomed with open arms. Thoughts off all the unexplained occurances during the past decade stopped Patrick in flight, so quickly that Caryn bumped into him and almost fell. How long had Brad been crazy? Forever? Ten years? Five? Three? Had the quest for a million dollars slowly corrupted his mind until nothing of the old Brad was left? Three years ago, in the tower, the McCreedy girl had gone missing. If Patrick remembered correctly, Brad had been in town. Crazy Brad had been in town! Brad stepped forward, waving the gun. "I want to know where you hid that brooch? It's worth a pretty penny and will solve all the problems that I have." "What are you talking about?" Caryn said. "You did bring the brooch that your beloved gave you, didn't you?" Brad demanded. Caryn stepped forward. "How did you know about the brooch?" "I saw a picture of it that Patrick had. It was on his grandmother's wedding dress. I recognized that piece of jewelry. A famous 16th century jeweler made it for the Duchess of Kent. It's said that on a trip to Dublin, she gave it to the young man who saved her life when carriage ran off the road. It was thought to be lost." He smiled at Patrick. "And all this time, your family had that little jewel. I'd like it now." Caryn couldn't believe the story that Brad told. Had he been the one to give Patrick and her the wrong information? "It was you, wasn't it? You who lied to Patrick and me? And for what?" "For over a million dollars, that's what. It's taken me a long time to track you down, but I knew you'd come running when Patrick asked. He was sick with love. And I knew without him being here, I couldn't get you here. Now where's the brooch?" He waved his gun at Patrick. "And let's be quick, because I've waited a long time." Patrick looked at Caryn. The world after 10 lonely years righted itself. Thank you, Lord, he whispered. He saw love and longing in those beautiful eyes. 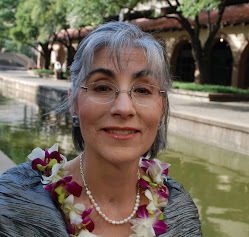 "I brought the brooch with me, but I hid it in the castle," Caryn said. "The top room. Waving his gun, Brad said, "Let's go get it." They started back down into the tunnel. Patrick squeezed her hand, hoping to alert her to follow his head. She squeezed back. At the juncture where the tunnel split, Patrick pulled Caryn to the wall, then kicked out and caught Brad's hand. The gun roared, and a spark flew off the rock wall. In the next instant, he pulled Caryn into a run, following the other tunnel they didn't take. "I left you at the altar?" Had Patrick heard Caryn right? Surely she was daft or maybe she'd been hit over the head like him and didn't know what she was saying. She moved several feet from him. "We were supposed to meet up in New York. I wanted you to meet my parents. I phoned and left the directions to the restaurant, but you never came. I tried to call you again, and your roommate told me you were gone. Went back to Ireland." "I never went back to Ireland until I graduated. Why would Brad tell you that?" "That's a good question, and one I would like to ask your roommate." 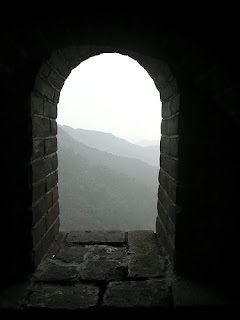 Rubbing his hand across his nape, he stared at the stone wall where the small window let in slivers of moonlight. The storm must have passed quickly. "I called you, and your parents wouldn't let me talk to you. They said you were traveling." "Yeah, as a nanny. I was traveling with a family, but my parents never told me you called. Probably because they knew how upset I was when my letters were returned from Ireland unopened." "I don't understand any of this." He rose slowly to his feet and keep his hand on the wall nearby to steady himself. The cold chill of the stones iced his blood and the feeling of the room growing smaller sent his heart pounding against his ribcage as the waves pounded against the rocks below. "Neither do I," Caryn said in a voice that for the first time didn't hold anger. "Who hit me from behind? Have you seen the person who put me in here?" Their cell spinning before his eyes, Patrick leaned more heavily against the wall, his hands gripping its rough edges. "I never saw his face. It was always hidden. And I don't recognize the voice. A man--that's all I know." Patrick scraped his hand across the stone as he tried to straighten and get his bearings. His forefinger hooked into a hole and pressed against something cold. Suddenly the wall shifted, and he nearly fell through the opening. He caught himself. The creaking sound of the gears moving reverberated against the prison they'd been trapped in. He'd known there were secret passages in the old castle that his ancestors had used for escaping, but he'd never found one until today. "Let's get out of here before that man returns." Patrick held out his hand for Caryn. She fit hers in his palm while he used his light on his key chain to fumble his way down another narrow tunnel. He pushed the uneasy sensation from his mind and kept going. Their lives might depend on it. At a bend there were two ways he could go. "Left? Or right?" he asked, glancing back at Caryn's beautiful face, pale in the dim light. She pointed right, which led upward, while he waved toward the left. Caryn chuckled. "We still can't agree. I concede. We'll go left." The sound of footsteps coming quickly filled the narrow corridor. He gripped Caryn's hand and practically dragged her down the path to the left. Sweat beading his brow, Patrick ran as swift as he could without stumbling on the uneven surface. Moonlight poured in through a wide entrance. "The way out," Patrick said, the salt air spurring him even faster toward the exit. All of a sudden, noting the dark void ahead, he skidded to a stop, one foot sliding off the side of the cliff. Pebbles he'd dislodged, crashed to the sea below, frothed with angry waves. Caryn clung to him, holding him from teetering off the ledge to his death on the rocks below. He struggled back from the opening, getting his footing on firm ground. Caryn threw her arms around him. "I thought I'd lost you." "I hate to break up this little reunion, but I want the brooch. NOW." Patrick spun around, pushing Caryn behind him, and came face to face with his old roommate, Brad, with a gun in his hand. Pointed at his chest. Caryn pushed on the heavy wooden door for the hundredth time in as many minutes. “Arghh!” The frustrated scream ripped from her throat and echoed around her. Why had she believed that stupid letter? For the first time, real fear crawled up her spine and settled at the base of her neck. Goosebumps pimpled her flesh and she realized she might be stuck here. But Patrick’s letter had sent her heart into a tailspin. He asked her to meet him at Shamrock Castle. And this time she planned to confront him about the past. Why had he disappeared on her? Professed his love for her and given her a family heirloom—then disappeared! Her fists clenched at the memory. Well, he was home now and she planned to confront him and give him a piece of her mind. As soon as she figured a way out of here. But the laughter had faded Caryn shuddered to realize she’d walked into a trap. “Patrick! Is that you?” Of course it was him. She’d never forget that voice. How she’d dreamed to hear it again, dreamed of his sweet kisses and promises. And now he was here! Walking into a trap just as she’d done. She had to warn him! “What--?” A thud sounded followed by a harsh yell. Caryn wanted to confront the evil person on the other side of the door. But she didn’t dare until she saw that Patrick was safe. She slid back just far enough so the door could open. When her nemesis saw that she was out of his way, he open the door and shoved a woozy Patrick into the room. Caryn bolted toward him and caught him around the waist just as the door slammed shut. She heard the lock click as she lowered him to the floor. Then all was quiet once more. Except for Patrick’s harsh breathing and glassy eyed stare. He shook his head and grimaced. “Why would Ma send me here into danger?” he slurred. His hand reached up and traced her features. He stared at her like he’d never seen her before. Then his fingers entwined themselves in her auburn locks and he pulled her down until her lips met his. Flustered, Caryn longed to have a repeat performance, but she didn’t just go around kissing men she hadn’t seen in a decade. Especially not ones who made promises they couldn’t keep. Patrick stared down into the black throat of the passageway and blinked as the distant, faint light flickered, faded, and then extinguished, leaving him in total darkness. Had he really heard Caryn's sweet, soft voice drifting on the night air? Could she possibly be here, after all these years? Caryn was gone for good. She'd said she would always love him...and then she'd disappeared, taking with her the treasured filigree brooch that belonged to his family, along with a big piece of his heart. Maybe his mum had seen a tourist with the same rich, auburn hair and flashing emerald eyes, but had only imagined a fairy tale ending to a story that had ended long ago. She was getting on in years, after all. Maybe she was even slipping into senility and starting to see things that weren't there. Recalling all of the local tales about leprechauns and ghostly beings who supposedly walked the ruins of this castle, Patrick laughed at his own folly. It didn't take senility to fall into the world of make-believe around here. For years, the villagers--mostly the ones who owned the quaint pubs and gift shops and B&Bs--had shared that nonsense with the tourists who passed through. Now, even the Ireland travel guides printed in America mentioned the fanciful history of the area. Bracing a hand against the damp stone, he fumbled through his jacket pockets for the keys to his rental car. 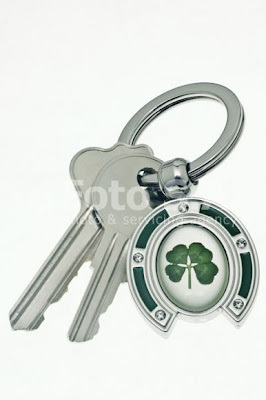 At the airport, he'd rolled his eyes at the big green plastic shamrock on the keychain, but now he breathed a quiet prayer of thanks as he pressed a button on its surface. God, you were looking out for me before I even knew I needed help. The shamrock sent a thin beam of light lasering through the darkness, illuminating the solid wall of rock behind him where there'd been an open doorway just a moment before. He explored the rough surface with his fingertips, looking for some sort of trigger mechanism. Shoved at the unyielding stone. It fit perfectly, seamlessly--without even the smallest gap or variation in color to suggest that it hadn't stood in place undisturbed for the last four hundred years. 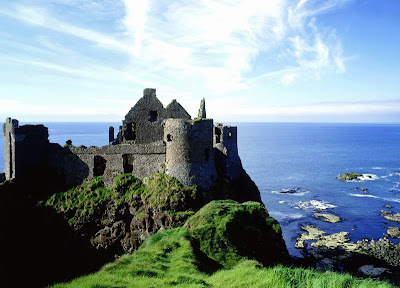 The roar of the waves crashing onto the rocks at the foot of the castle was muted now. Eerily distant. A menacing bank of storm clouds had swallowed the moonlight while he was making his way through the castle, and now he heard a crack of lightning so close it shook the ground beneath his feet and sent dust drifting through the air. The narrow passageway closed in on him. An all-too-familiar surge of panic rushed through his veins as images of explosions and fire and collapsing rubble overhead slammed through his thoughts, coupled with the sound of his cameraman's screams...and his own. But this was lush, green Ireland. Not Iraq. And that was thunder and lightning outside, not the sound of gunfire and grenades. He took a steadying breath and forced back the memories as he angled the tiny beam of light toward the downward sloping passageway. "Hello? Is someone down there?" 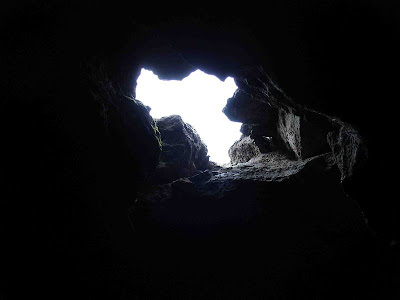 The first, tentative sound of tiny claws scrabbling against the rock overhead burst into an explosion of leathery wings flapping in sheer panic--hundreds, maybe thousands of bats--careening into the walls and each other. Crashing into him. Clinging for an instant. Crawling up his jacket, then rocketing away. With a whoosh they seemed to collectively regain their bearings, then they poured down the passage way like a river of gray, barely distinguishable in the faint light. If the bats headed that way, there had to be an exit. And if he was lucky, it would be one he could fit through. And sensed that he was not alone. "Caryn?" he whispered. "Are you here?" No one answered. He studied the heavy iron hinges, then pressed his fingertips against the surface. Pushed harder. The rusted iron shrieked as the door slowly, slowly swung open. A heavy footstep dragged across the floor, somewhere in the pitch darkness ahead. Then another...coming closer. From somewhere farther ahead, in the bowels of the castle, he heard a terrified scream. It had been ten long years since he'd heard that voice, but the sound of it arrowed straight to his heart. It was Caryn, and she was in trouble. And now nothing--and no one---was going to stand in his way. “You’ll find Caryn waiting for you in the turret tower,” Patrick’s mum had claimed when he stopped at her cottage in the village. 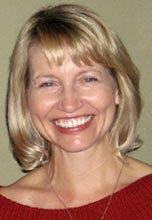 She spoke with a sense of urgency and had a mysterious glint in her eyes as she assured him of Caryn’s continuing love. “She’ll explain everything,” the older woman said, taking his grandda’s walking stick from the corner and placing it in Patrick’s hands. “You’ll need this shillelagh where you’re headed, Paddy dear. Now off with you.” She had shoved him out the door with nary another word, and Patrick hadn’t looked back as he’d hiked across the lush green countryside to the foot of Shamrock Castle. Night started to fall as he passed through the crumbling castle entrance and headed for the steps that led to the turret tower. Long shadows danced across the walls and taunted him from the nooks and crannies of the stone structure. The briny smell of the sea filled the air, reminding him of Caryn’s love of the water and her sailboat, The Shamrock Queen. At first playful, the wind teased his hair and pulled at his jacket as if to steer him off course. Focused on finding Caryn and the answers to her disappearance, Patrick continued to climb while the wind gathered strength and shrieked around him, reminding him of stories his mum told about banshees keening for the dead. He shook his head, hoping to send the superstitious thoughts scurrying into the darkness. He didn’t believe in the spirits she claimed haunted the castle. Although loveable, some of the villagers said mum had turned a bit daft in her advancing years. After all, she believed there was a pot of gold at the end of every rainbow and that he and Caryn could find true love and live happily ever after. His more practical side knew ten years was too long to wait, even for true love. Patrick wanted to see Caryn but only because he needed the brooch, which belonged in the Mulligan family. Yet as he climbed higher, he wasn’t thinking of the brooch. He was thinking of Caryn’s twinkling eyes and the way her lips curled into a luscious smile he longed to kiss. “Perhaps I’m the one going daft,” he mumbled, raking his right hand through his hair. In his left hand, he clutched the shillelagh his grandda had used in every St. Patrick’s Day Parade he could remember. Proud and tall, his grandda led the parade through the village to the steps of the Stone Church. If a young lad and lass came forward, asking to be married, good luck would befall the village for the rest of the year. How could he have forgotten something as important to the Mulligan family as the St. Patrick's Day wedding proposals? His mother left unspoken her own desire for him to follow suit, which would have happened if not for Caryn’s disappearance. No doubt, the free spirit he had once loved with all his heart would try to explain her absence with some tall tale that made perfect sense to her, yet would make him realize their relationship had ended years ago. Which it had, he kept telling himself. Then he thought of the russet hair he longed to wrap through his fingers. As he neared the end of his climb, his heart thumped hard against his chest. His mouth dried, and warmth curled through his gut. Stepping onto the top landing, his eyes focused on the closed door to the room where she waited. Gathering his courage and trying to control the jubilation that filled him anew, Patrick grabbed the knob and pushed the ancient oak door open. “Caryn,” he whispered. Twilight spilled through the windows, brighter than the darkness of the stairwell. He squinted into the light, imagining her there, but his face fell and his internal warmth turned cold when he realized he was alone. Patrick wiped his hand across his cheek, feeling moisture that left him questioning his own good sense. He didn’t love her, did he? In the distance, he spied a boat, gliding across the water, its white sail adorned with a giant shamrock. Were his eyes playing tricks on him? Caryn’s boat had flown the same sail long ago. Dropping to his knees and ready to place his head in his hands, Patrick spied a tiny mound of shamrocks, lying on the floor. Tucked in the middle of the newly picked clover was a scrap of parchment. Unfolding the paper, he read: Don’t be afraid to follow your heart and enter the secret passage. Caryn had talked about finding a secret walkway in the old castle. He turned to stare at the walls surrounding him. Where could it be? His fingers played over the hewed stones, but he found nothing. Twilight was turning to darkness, and he needed to retrace his steps to the ground level below. On the way down the stairs, he tripped and fell against the wall. Instead of holding firm, the rocks moved, revealing a narrow opening. Patrick thought of his job in New York and the life he had lived for the past ten years. Then he thought back to when he and Caryn were together. He remembered the feel of her soft body wrapped in his arms and could almost breathe in the fresh scent of her. Follow your heart, the words flowed over him as he stepped into the dark passageway. The wind howled once again, and with a giant sigh, the rock wall slid shut behind him. He blinked into the darkness. A faint light appeared far ahead, and a voice Patrick recognized called his name. "Patrick, you have to come home. Immediately." Patrick Mulligan stared up at the crumbling walls of Shamrock Castle, the sound of ocean waves crashing behind him while memories of his mother's plea crashed inside his head. He'd come home from the chaotic life of a reporter in New York to the quiet, quaint countryside of Western Ireland to find out the truth and to hopefully find the brooch that had belonged to his mother Emily. Someone had stolen the beautiful golden filigree brooch that had been passed down from generation to generation through the brides of the Mulligan clan. And that same someone had broken Patrick's heart. Patrick kept his eyes trained on the turret room, where he'd met and fallen in love with green-eyed, red-headed Caryn. But they'd never had their wedding day and he'd never seen his bride wearing the fabled piece of jewelry on her wedding dress. Because instead of waiting for him to return, Caryn had taken herself off on her own grand adventure. And she'd used his grandmother's precious brooch to finance her trip. "I'll always love you, Patrick.We'll always be together soon. I love you. And I'll wear this brooch on our wedding day." "I have so many dreams, Caryn. I want to make a life with you in New York. I want to have a big family like your family. We'll be happy. I know I can make you happy." His smile bittersweet, Patrick remembered how Caryn, who had come from America to visit relatives in the village, had managed to sneak into the ancient ruins of the castle and find her way up to the turret room. He'd been walking across a field, intend on going up to his secret place to write in his journal and dream about going to New York. But when he saw the pretty young woman standing in the arched window, looking like a trapped princess, Patrick had lost his heart forever. It had been as if he'd seen a brilliant rainbow and gone over the top to find a pot of gold. But time and circumstance had changed all of that. Patrick had been filled with wonderlust and so off to America he'd gone to make a career in journalism. 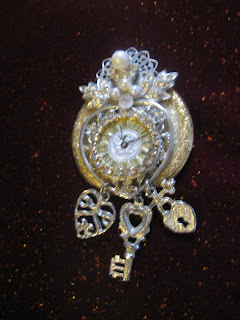 He'd hoped Caryn would return to America, too, and join him there, but immediately after he'd left with plans to attend college and meet back up with Caryn in New York so they could be together again, his true love had disappeared, along with the brooch he'd given her as a token of his love. Patrick tried to find Caryn in America, but her family refused his phone calls and he had no other leads. Why wouldn't she come back home the big Irish family she loved so much? Why had she abandoned him? And why had she used his treasured token of love to run away? That had been ten years ago. Since then Patrick had finished college and gone on to become a determined reporter. When his mum had called him a few days ago to tell him that Caryn was back in the tiny village by the sea and needed to see him right away, Patrick had immediately hopped on a plan and come home to Ireland. He needed answers; he needed to see Caryn again. He was a reporter and a journalist, after all. And reporters liked to get to the bottom of things. Brushing dark bangs away from his face in frustration, Patrick turned from the old castle ruins to the foamy sea that reminded him of Caryn's eyes. He'd find the truth, if he had to climb a rainbow and go to the other end. And ... he'd finally get the answer to the real question that had burned inside his gut for so long? Why had Caryn broken his poor poet's heart? Today we're welcoming Gabby Rogillio, the heroine of Dead Air by Robin Caroll, March 2010. 1. Tell us a little about yourself and how you came to be in the midst of such suspense. Well, let me tell you, I never had any intention of being in such an adventure. I was on the road to my goals—having my radio show syndicated and buying my dream home. Murder of my dear friend and coworker, then the ensuing investigation which lead police to believing the station’s owner was the murderer…I had to do something. 2. So, during the book you met Clark McKay. Tell us a bit about him. What was your first impression? When did you know it was love? My first impression was that I couldn’t trust him. There was something about him…big-city smoothness. But, over time, I learned to trust him. Especially when he believed in my friend’s innocence and helped me on the case. 3. What strengths/skills do you have? What is your greatest weakness? I think my greatest strength is my faith. My greatest weakness? Has to be fear. I know fear doesn’t come from God, but it’s so hard to live that knowledge in everyday life. 4. What scares you? Being hurt again. 5. If you could change one thing about yourself, what would it be? I guess that for so long, I let the pains of the past interfere with my present. 6. Where are you in your faith at the start of your story? I believe I’m a spiritually strong person. But, as all Christians are, am a work in progress in my faith journey. 7. Where are you in your faith at the end of the story? Again, I think I’m always learning and growing in Christ. 8. You've got a scripture at the beginning of the story. Tell us why this scripture is significant. Phil 3:13—letting go of the past and moving forward to the future. Christ didn’t call us to live with regrets of past mistakes, but to walk boldly in His glory in the present and into the future. 9. If you could be a dessert what would you be and why? An apple fritter, of course, cuz we southern belles are warm all on the inside, but can stand up better than cakes or pies. Thank you, Robin for sharing Gabby with us. This sure sounds like an exciting read! When she finds her coworker's body in front of the station doors, nighttime DJ Gabby Rogillio knows it was murder. But how can the police suspect the station's owner, a man who's been like a father to Gabby? She's determined to clear her friend's name, and will recruit anyone she can find to help. Even the mysterious newcomer in town, handsome businessman Clark McKay. Gabby doesn't quite trust Clark, but she can't crack the case alone. Especially when the killer threatens them both—either back down from the investigation…or be silenced forever. A Big Hello from Lisa Mondello. I want to take a moment for a quick shout out to our regular blog visitors from the US, Canada, Romania, Australia, Vietnam, the Philippines, Africa, France, Denmark, Netherlands and the UK. It's always great to see where the Craftie Ladies of Suspense visitors originate from and we appreciate you coming back. St. Patty's Day is going to be here soon and since our Valentine's Day story was such a hit, we're going to do another story for St. Patrick's Day. More on that in a few days when everything is squared away. And if you don't want to miss a single post of the St. Patty's Day story, make sure you scroll down to the bottom of the page and sign up to be a FAN on the Craftie Ladies of Suspense FACEBOOK page. Now, to my subject heading. If you're a writer, chances are you've pulled a "few" all nighters to get a manuscript finish by the deadline. I know myself that I'm a back-to-the-wall-writer and I thrive that way. When I'm on a deadline (which is pretty much all the time since I write fiction AND non-fiction work) I set my date on the calendar for the project and the juices of the muse start flowing. I write and revise non-stop when I'm on deadline. I need a timer to remember to pick the kids up from school or that I've put something on the stove. (One day I'll tell you how I turned hard boiled eggs into popcorn!) But those moments when words are flowing and the magic of the story is coming together is really exciting. What does this have to do with Obama and health care? Pulling all nighters, grabbing a bite to eat (usually not as healthy as I'd like) and running from one commitment to the next can wear you down very quickly. It's hard to stay healthy and get regular exercise when you 're chained to your computer. After a long haul, you'd think I'd take a moment to catch my breath and enjoy being done with a writing project. Unfortunately, when I'm on a tight deadline my house suffers. So I go from one marathon project and start up again with marathon cleaning! It's a good thing I don't notice the dust when while I'm writing. I always tease my husband and tell him that one day when I'm rich and famous I'll hire a housekeeper to do my cleaning and laundry. Well, that day hasn't come...yet. What do you do to keep yourself healthy when you're on a deadline? How do you fit in exercise, daily committments AND give your writing projects your all? For me, I am on a first name basis with the local take-out restaurants. And I truly LOVE my crock pot. If I'm organized for 15 minutes in the morning I always feel like someone else has cooked dinner for me when I emerge from my little writing room at the end of the day. I wonder if there is a special line in Obama's Health Care package that addresses the working writer. What do you think? This is one of my favorite places to think. It’s a park near my home, and a frequent refuge for me, especially in the winter. I am not a fan of long stretches of dreary days, and we’ve had a lot of them this season. In fact, back in the fall, we went for almost six weeks without the sun. As winter crept over us, sunshine still remained a rarity, sometimes only making a brief appearance for an hour or so, then more clouds. I began to crave sunlight the way a thirsty man desires water. At the least little hint of it, I’d dash to a window or grab my coat for a walk. If there was a promise of a few hours, I’d flee to the park, where I’d sit on a bench and soak up the light, or take a brisk walk on the exercise path. More intriguing to me, however, is that I get this way about God. I don’t always get to church, but if I go for very long without praying or talking with other folks about God, I get a little squirmy, as if something’s just not right, as if I’ve forgotten something important. Which I have. So my restlessness tells me it’s time to “dash to the window,” so to speak. To seek that renewing Light. Only, unlike the sun, this Light craves me as much as I desire Him. Definitely a reassuring thought on a cold, dreary day. I'm working hard on a suspense but I keep stopping to do fascinating research. This book involves a lot of things--animals (including two alligators named Boudreaux and Bobby Wayne), Texas Rangers and all the duties and protocol and procedure of these larger than life heroes, an animal rescue/rehabilation expert (my heroine) and a whole slew of really bad guys out to take over the world--or at least Texas. This had made my writing slow going, but once I get a good piece of detailed research out of the way, I get right back into the story and become involved with my characters--especially their developing love story which had taken on a life of its own. This is way too much fun and I get paid to do this! What more could a girl ask for? More time to research, of course! But that did get me wondering--do writers love research? Do readers even notice the research (the details, the description, the layers of story and place that we try to put in there to make everything seem so real? )So what do you say, people? Love it or hate it or just tolerate it but research and its friend development both have a place in a suspenseful story. It's one thing to explain how an alligator can run at about forty miles per hour. It's quite another to name that gator Broudreaux and give him a personality. That's research and development. And that's one of the fun parts of this job. Tell us what you think. We also like to take polls now and then. Recently, I met with friends Cindy Gerard and Kylie Brant for a weekend at a casino hotel midway between our home towns. Nope, we weren't out enjoying the sights, the shows, or having fine dinners...and we didn't even get close to the casino itself. We were holed up in the room, working! We do this once or twice a year---an intensive round of brainstorming for individual, future projects. It's amazing, what happens. The energy, the excitement, the moments of clarity... synergy that generates ideas which (we hope) will gel into solid story ideas for each of us to work on later. Cindy and Kylie are amazing, by the way! By the time the weekend ends, I am deeply thankful to my friends, deeply hope I have been a help to them, and I can't wait to get home to translate my pages of rapidly scribbled notes. Are you a writer? Do you ever brainstorm with others? Two weeks ago I wasn't going to watch the Olympics much, but I got sucked into it. First because I love ice skating so as I waited for the broadcast on the figure skating I started getting into the other sports--except curling. I could never understand that sport. The United States had some ups and downs, but overall there were some great moments for the U. S. but also other countries. I loved watching the female figure skater from Korea perform--beautiful and breathtaking. Or the female Canadian figure skater who dedicated her performance to her mother who had just died. What a moving story. Another sport I really enjoyed was the snowboarding. Some of the tricks that were done were fantastic. I don't know how the snowboarders would ever work up to some of them. They looked like they were defying gravity. We won some medals in sports we hadn't gotten a medal in years. 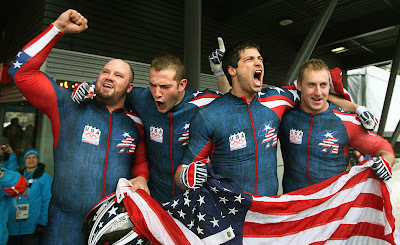 What a great feeling for the US athletes for the four man bobsled yesterday. Congratulations to everyone who participated even if they didn't win a medal. The fact they you were there was something most of us couldn't do. And although the United States men's hockey players lost to Canada's, they fought a great battle. What a game!! Did you watch any of the Olympics? What was your favorite moment? Favorite sport?